A fun play on the classic gratin, this delicious Brussels Sprouts Gratin dish is filled with veggies, cheese and topped with yummy Cornbread Crisps. For a classic cornbread twist, use our Original, but if you love spicy like we do, try the Jalapeño! Season Brussels Sprouts with salt and pepper. Cook in a skillet over medium high heat 5-6 minutes or until tender crisp and slightly browned. Pour into a 2-quart baking dish. In the same pan, heat heavy cream, red pepper flakes, garlic powder, salt and pepper to boiling. Reduce heat and let simmer 2 minutes. Remove from heat and whisk 1 cup of cheddar cheese. Make sure cheese is fully melted; fold the Brussels Sprouts into the sauce. Pour the mixture into a baking dish and bake for 15 minutes. While the gratin is starting to bake, make the crunchy topping. Melt the butter in a small pan. Add the Cornbread Crisps crumbs and stir until the butter has been evenly absorbed. Place in a bowl. Add 1/3 cup Cheddar and the Parmesan cheese; stir well. 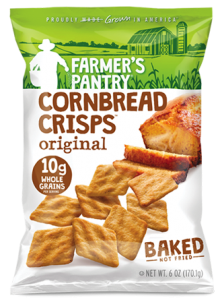 When the gratin has baked for the first 15 minutes, remove from oven and evenly sprinkle the Cornbread Crisps crumb mixture onto it. Bake for another 15 minutes until crisp and bubbly.